New to Bolt Action after years of playing Warhammer 40k? 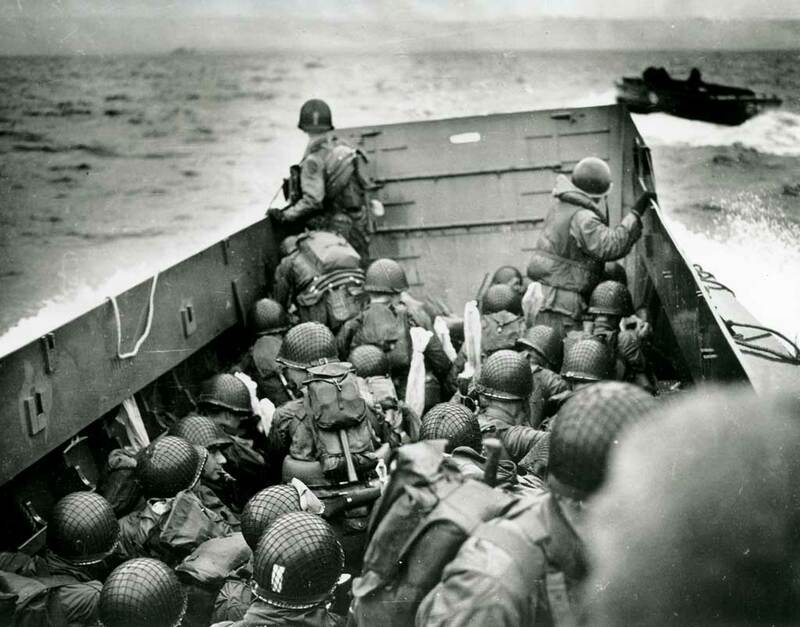 We’ve got a handy guide to get you started – just in time for D-Day! 40k players are everywhere. Indeed most of the staff at Warlord Games have spent many happy hours painting Space Marines or Eldar and gunning down Tyranids and Orks (etc, etc). For that matter, most of the staff worked down the road at Games Workshop HQ at some point, and many were involved in the creation and evolution of the Warhammer 40,000 game. Well for starters, Bolt Action is written by Rick Priestley, author of the original 40k Rogue Trader rules, and Alessio Cavatore, author of the 40k 5th and 6th edition rules and numerous Codexes. 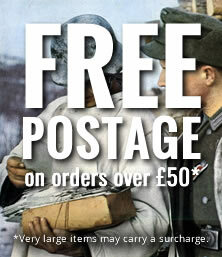 Certainly, anyone used to 40k will not find it hard at all to pick up Bolt Action. Many core concepts are familiar – for example, a basic infantryman shoots with one dice, and there is a second roll to cause damage. The system is also written up with a core rulebook and 7 supplemental army books for the various fighting nations – Germany, USA, Britain, etc – fulfilling the same task as the Codexes. A supplement focussing on tank battles is also available, along with others concentrating on particular theatres of the war, such as Western Europe, the Pacific and the Eastern Front. 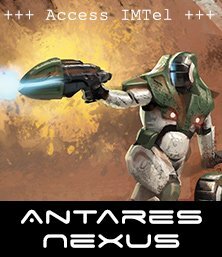 Incidentally, both writers are regularly involved in creating new material for the game – rules for new models, special scenarios, FAQs and tournament guidelines, etc, etc. The first is not about the rules at all, but important just the same as it underpins everything. In place of all the 40k background stories, Bolt Action players have a wealth of genuine historical information on World War II. The complexity and scope of this world-spanning conflict is quite staggering, and there are always more fascinating details to discover, made all the more compelling (and sometimes sobering) because they happened to real people! Probably the biggest difference in terms of the rules is the way that turns work. Instead of a you-go-I-go system, players get to issue an order to one of their units each time their colour dice is drawn out of the dice bag. You put in one dice for each element in your army, so forces with lots of units are more likely to act before an opponent with fewer, more powerful models. Secondly, instead of the strict sequence of Move-Shoot-Fight, in Bolt Action you can give any order you like to a unit – including Run, Fire, Advance (move plus shoot), Down (take cover), Rally or Ambush (for those who fondly miss 40k overwatch!). All this means that the action unfolds on the battlefield in a fluid, unpredictable way, and you never know if you or your opponent will get to act next. The amount of rules in the Bolt Action game is a small fraction of what you need to wade through for your average 40k battle. There are far fewer special rules for individual units and no plethora of variant army lists to add even more. This is in part because it’s a much newer system that hasn’t had years of additions, and also because both Rick and Alessio have a distinct preference to keep their rules systems lean and clean. As a result, Bolt Action is way easier to learn and reach a competitive standard, because the knowledge barrier is much lower. On the Bolt Action battlefield, a model’s survivability depends on experience rather than armour – veteran troops are far more likely to survive than raw recruits. Experience also improves a model’s Morale statistic, making it more likely to follow orders. Meanwhile, veteran tanks are less likely to be pinned by enemy shooting. Without the benefit of power armour, World War II troops can be suppressed by incoming fire, making them worse at shooting and less likely to follow orders. Once a squad has 2 or 3 pin markers, it becomes quite hard to get it to do anything useful! In Bolt Action there are no Special Characters capable of slaughtering entire armies single-handed – your forces need to work together in order to seize victory. Of course, there are thousands of real-life heroes who achieved remarkable feats, many of whom can be fielded on the tabletop. However only a few of these have unique rules – for every famous medal-recipient there were plenty of unsung heroes, just as brave and resourceful. OK, so there are plenty of tanks in Bolt Action, but no foot-tall Stompas or Knights. However, if you want to play a game where the Germans developed giant killer robots, then check out Konflikt ’47. This ‘weird war’ version of Bolt Action takes place in a reality where the Axis and Allies developed large walkers and strange new weapons based on mysterious ‘Rift technology’, continuing the war past 1945. 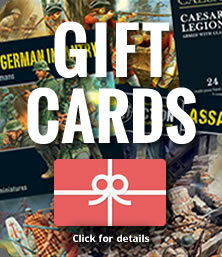 This allows you to supplement your historical army units with Panzermechs, Jump Infantry, Rail Guns, Zombies and much more! The 40k model range is full of epic, heroically posed, larger than life miniatures with enormous guns, that look great painted in bold colour schemes with strong highlights. 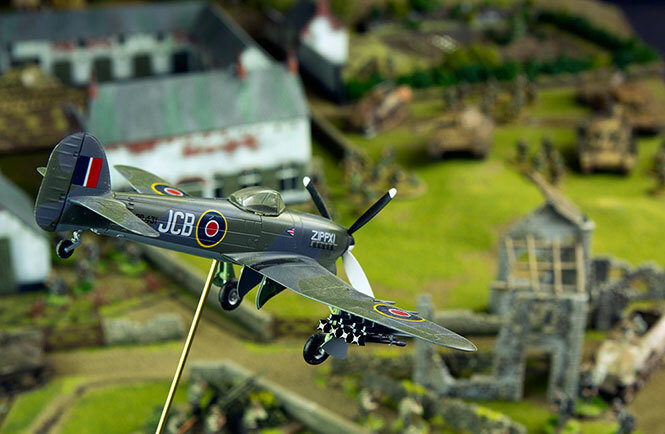 A World War II Bolt Action army is a perhaps a more subtle pleasure – naturally more realistic, less chunky, and once painted in authentic camo, harder to see on a modelled tabletop. Of course, there’s just as much scope for conversions using the multi-part plastics and real-world accounts and photos for inspiration. 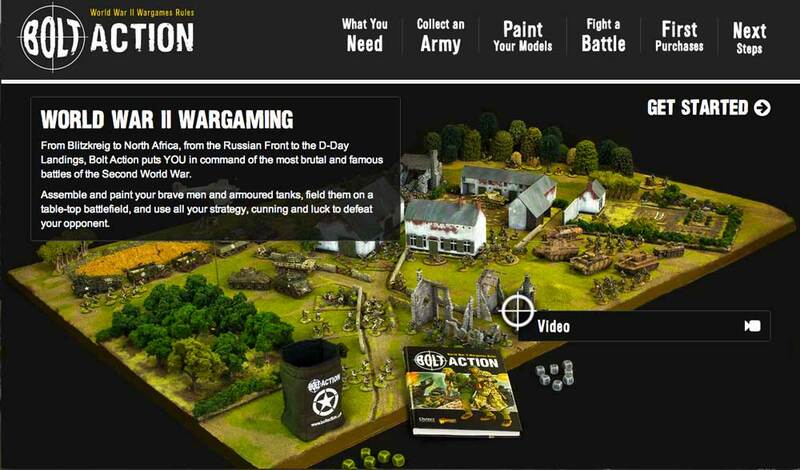 The ‘standard’ size for a Bolt Action game, at least as generally accepted by the gaming community, is 1,000 – 1,500 points. Point values generally equate across the two games, but World War II games arguably look less realistic if the table is too crowded. 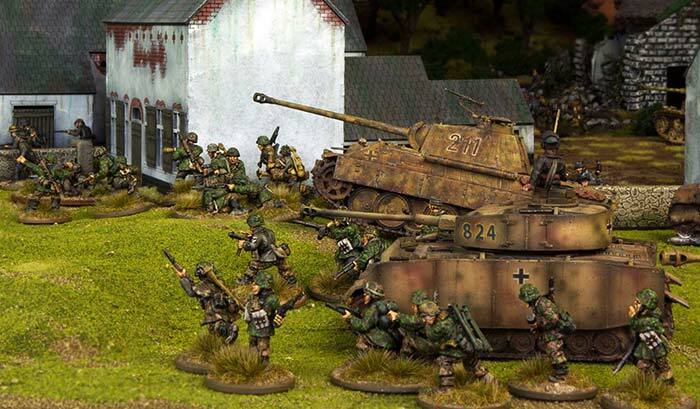 Certainly if you compare the cost of putting together an equivalent army, a Bolt Action force makes considerably less of a hole in your pocket! 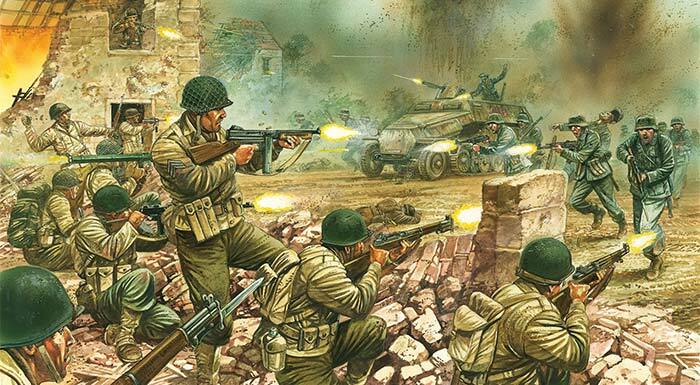 Containing two opposing forces, ‘Band of Brothers’ includes all the Bolt Action rules as well as a scenario booklet guiding your through your first steps in the game. With everything you need to get started in the box, excluding glue and paint, you will be able to start playing straight away. Band of Brothers is the ideal way to begin your battlefield career in Bolt Action!